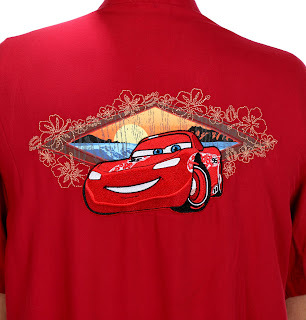 While I was browsing the Disney Store "booth" at this past D23 Expo (yes, the one with the four hour wait), I stumbled across this fun Cars tropical/Hawaiian style button up shirt featuring Lightning Mcqueen! While this isn't a typical shirt that I would usually purchase, I immediately thought it would be perfect for our upcoming Disney Cruise vacation next month...So I went for it (despite the $69.99 price tag). The shirt is soft and quality made with fantastic embroidered elements- such as a hibiscus flower design along the front, the number "95" on the sleeve and Mcqueen himself on the back. It's really cool! 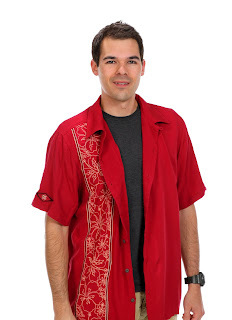 I've looked everywhere online to find additional info on this shirt, but couldn't find anything. Mysterious! I'm not even sure exactly who made it (the tag doesn't say). What I do know though, is that this was exclusive to the expo and won't be available anywhere else (at least that's what they told me there). If you're interested in this shirt for you collection, your best option would be to check eBay every so often for availability. Best of luck! Be sure to email me or leave me a comment with any comments, questions or suggestions.